You know I’m a fan of the do-ahead breakfast for busy (and early) weekday mornings. But holidays and weekend brunches are also the perfect time to prepare a fabulous breakfast the night before. On Christmas morning, the kids love to come down in their pj’s and see what Santa left for them and I don’t want to be stuck in the kitchen missing out on all the “oohs” and “ahhs.” It’s also a great feeling to be able to relax after a late night of Christmas Eve revelry and still put a hot breakfast on the table for everyone. 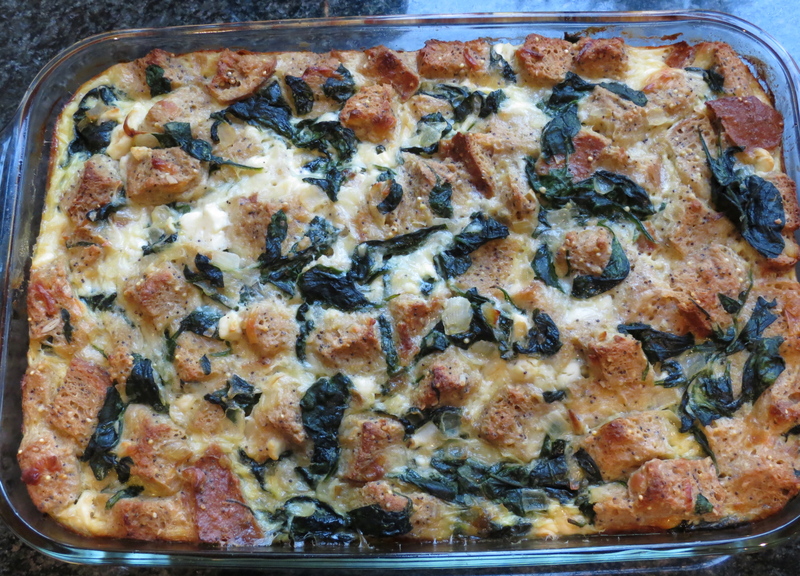 Breakfast strata to the rescue! A strata is technically a layered casserole, which mine is not since I just mix everything together in a bowl and pour it into a casserole dish. 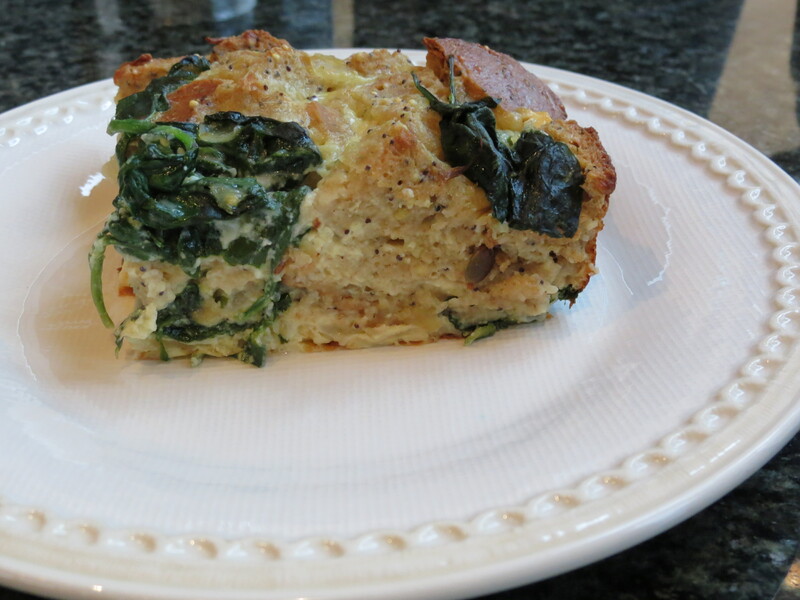 This recipe is more of a savory bread pudding to which I add lots of spinach and in the summertime, ripe tomatoes. In my quest for efficiency in the kitchen, I love stratas for using up stale bread and leftover vegetables from last night’s dinner. 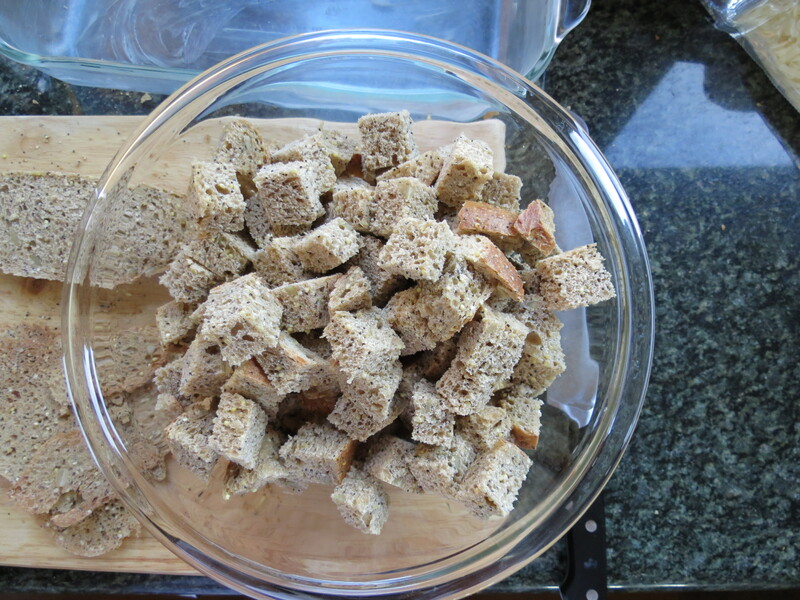 In these photos I used a multi-seeded bread, which is not the norm for me, but we loved it. Usually I buy a whole spelt bread from Le Pain Quotidien or a rustic whole grain bread from Whole Foods. As for vegetables, you can add anything you would put in a frittata. No spinach? No problem! Take those roasted or sauteed vegetables from last night and add them here. I’ve used broccoli, cauliflower, every leafy green there is, mushrooms, zucchini and cherry tomatoes. A couple of pieces of cooked turkey bacon or sausage links sitting in the fridge? They’re welcome in this strata. I’ve made a gluten-free strata with gluten-free bread and I’ve also made it dairy-free with hemp milk and a cashew-based cheese. Sadly, I haven’t figured out a substitute for the eggs for those with egg allergies. Don’t be afraid to freeze this, either. Provided you freeze the strata well-wrapped, it will taste exactly the same. We had about 50 people over for brunch the morning after my daughter’s bat mitzvah, and I had made and frozen several stratas 2 weeks earlier. It was such a gift to myself to just pop them in the oven the morning of and not to have to cook, especially since I couldn’t walk from dancing all night. So whether you’ve been “partying” at the shopping mall for the last few weeks or you’re just cooked out, give yourself and your loved ones this one last gift. Merry Christmas to all of you celebrating! Warm the olive oil in a large skillet over medium heat. Add the onion and sauté until tender, about 4-5 minutes. Add the spinach and cook until wilted, a few more minutes. In a large bowl, beat the eggs with the milk, sea salt and pepper. Stir in the cheeses, tomato (if using), bread and spinach-onion mixture. 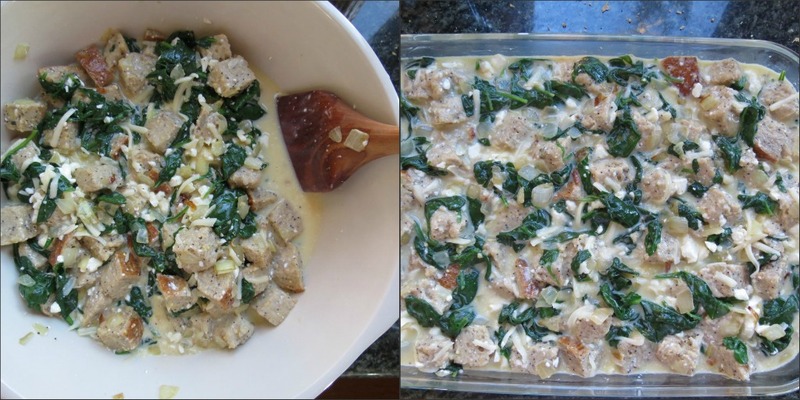 Lightly grease a 13 x 9 –inch baking dish and pour the strata mixture into the dish. Cover and refrigerate overnight. Preheat oven to 375 degrees. Uncover baking dish and bake for 45-55 minutes or until egg mixture is set and top is golden brown. Can be frozen if wrapped tightly. Thaw in the refrigerator before baking. I’ve done it and you can’t tell at all that it’s been frozen. MINI-STRATAS: grease 16 individual ramekins or muffin tins. First layer bread, then vegetables and cheese. Last, pour beaten eggs mixed with milk, salt and pepper on top. Bake for 25-30 minutes. I brought this strata to a friend’s lake house for a girls weekend. It received rave reviews! I used the seeduction bread from Whole Foods. The result was an amazingly delicious and healthful breakfast! The fact that I could make the strata ahead of time and freeze it was very convenient (and made it much easier to transport). The only modifications I made… I didn’t mix the tomatoes in, instead I added thin slices on top prior to baking. It wasn’t fully defrosted after leaving in the fridge overnight, so I baked it at 325 covered with foil for 30 minutes, increased temperature to 375, removed the foil and baked for an additional 45 minutes. Can fresh mushrooms be added to strata? If so should I sautethemfirst to get the water out if them? Thank you. Can’t wait to make this and serve it at Easter Brunch! Absolutely! 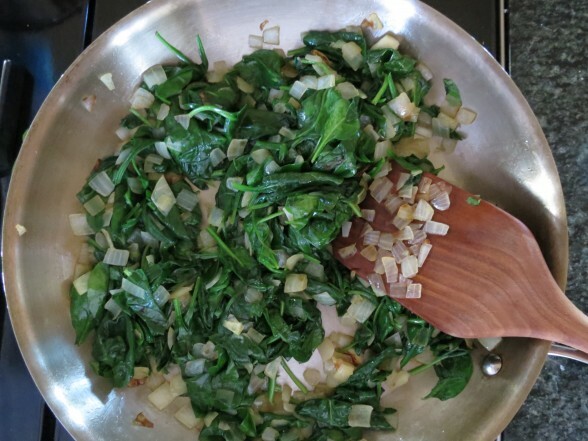 And you got it right — sauté them to reduce the water and increase the flavor. Happy Easter! This sounds like the perfect thing for brunch the morning of my daughter’s upcoming wedding. Her fiance’s family are all staying at our house (don’t ask!) and that means that on an incredibly busy day, somehow everyone has to get fed lunch (this applies to all the other days, too — they are strictly kosher so no restaurants — but the Sunday of the wedding, which is in the evening, is what I’m working on now). And I might not even be there, depending upon when I have to go to the hotel for the hairdresser — well, never mind! Anyway, I figured the simplest thing would be to have something brunchy like a so-called strata dish that I could make a week or so before and bake Sunday morning. A little bread and fruit and everyone’s good to go no matter what time they want it, right? So I’ve been researching to see whether such things are freezable, and luckily, as you know, they are. But every single recipe I’ve seen, including my favorite (yours), says to thaw completely in the refrigerator and then pop into the oven in the morning. (Always, always, “pop,” by the way. No other verb.) But no one ever says how long it takes to thaw completely! I don’t want to have a frozen middle. Do you think it would work with the muffin size? Would those be better baked before freezing? Thanks in advance for your help. Please reply by email in case my bookmark doesn’t work! Thanks. YOu mention than you can freeze this…before baking right? How long can it be frozen? I am thinking of doing this for a freezer meal swap and just want to give good directions. Yes, it freezes really well BEFORE baking. Wrap it tightly with aluminum foil to avoid freezer burn and freeze for up to 3 months. Thaw completely before baking and bake as directed. It will turn out great! Hi Pam, I am thinking about doing this for a brunch but need to have it fully cooked and ready by about 7:30am. Could I bake it the night before and then just warm it up the morning of the brunch? Or would you tell me just just set the alarm clock a bit earlier and not be such a wimp? Thank you again for your help. Happy New Year! You can reheat it if you want! Cover it so it doesn’t dry out. I prefer it freshly baked, though. Is getting up at 6:00 am to preheat the oven and then pop it in out of the question? That’s the better option, but reheating is definitely not out of the question. Enjoy! Hi Pam! Woke up early, it was not too bad, and baked it. Turned out great and was so easy! Delicious! Question, it I make this again with the muffin tins, is the bake time the same? Also, after I bake them in the muffin tins, can I freeze the leftovers in the freezer? Thank you! You’re funny. If you bake in muffin tins, I would reduce the time to about 25-30 minutes, depending on your oven. Sure, you can freeze the leftovers! My pleasure, Mary! Thanks for your feedback. Happy New Year to you! Made the srata to bring for Easter brunch tomorrow. Among the sea of French toast made with white bread, sausage, bacon, and cheese egg casseroles, I wanted to bring something that was healthy and I could eat. My husbands family does not always understand my meatless-ness. Can’t wait to pop it In the oven in the morning. Heading to the Farmer’s Market for some of the ingredients. Thanks for the inspiration for breakfast for tomorrow! This sounds yummy! Would you freeze it before or after baking? Excellent question! You freeze it before baking. Thaw it out and then bake away! this is one of my favorites! always a hit!